His side-kick, Roopa, a Brahmin-turned-dacoit, also has a temple to his name not far away. Both the temples are similar in design and architecture to any other North Indian temple, complete with a rising shikhara, the portico and the inner sanctum sanctorum. The deity at the altar is not any of the 33 crore Hindu gods and goddesses but a handle-bar mustached man with a gory criminal record. 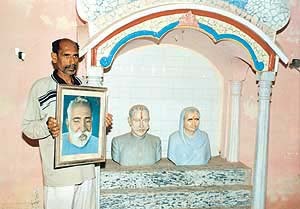 People in and around the Chambal Valley walk long distances just to bow before these marble busts in the temple and seek their blessings. Man Singh, the legendary dacoit of yesteryear, ran amok in the Chambal region long before Phoolan Devi landed on the scene and stole his thunder. The police had registered over 100 cases against him, ranging from kidnapping to murder, until he was shot dead in 1955 in an encounter in Bhind, (MP). However, for the people of this region he is up there among the pantheon of Hindu gods, fit to be revered. The temple not only has regular arti but has a full-time pundit to conduct the rituals. The construction of the temples began in the early 1980s and they are located in Khera Rathore in the Chambal region, the birth-place of many a dacoit. Both Roopa and Man Singh were born in this village and their descendants are living here. Man Singh headed a 17-member gang and his writ ran unchallenged through the entire Chambal Valley encompassing six districts of Uttar Pradesh and five of Madhya Pradesh. Most of the members ofMan Singh gang were his brothers or nephews who hid in forests or the labyrinthine ravines near the Chambal river. Dacoits were described as bagis (a romanticised label for a dacoit) literally meaning a rebel. But they were more than just rebels. They plundered at will and kidnapped for ransom. Villagers, however, credit them with virtues like morality, valour and courage. "They were not dacoits. They were bagis. They helped us in the times of need", says Ravinder, a villager. This is just as well. Man Singh and other big dacoits of the 1950s carry a Robinhood image for the people of the Chambal area. Local legend puts them down as heroes and men of valour. Villagers maintain Man Singh and his men did not plunder and rob indiscriminately. Like the legendary Prince of Thieves,Man Singh was said to loot the rich and distribute the goodies to the needy. If any poor farmer faced any problem, especially in raising funds for the marriage of his daughter, Man Singh was said to step in and make the necessary arrangements. The villagers have not forgotten this philanthropy even if it was their grandparents who benefited from it. "They were men who fought for the family honour. They are bagis. There is no difference between a bagi and a sadhu", says Dipankar, a Chambal resident who says he regularly comes to worship at the Man Singh temple. Family honour and prestige were (and still are) two very sensitive issues in the Chambal belt. Even a minor misunderstanding leads to a feud between families that can pass from one generation to the next. Upholding the family honour is top priority and there are people who do not flinch from shedding blood for it. Man Singh was one of them. He had turned bagi — after eliminating five Brahmins in order to avenge his brother’s insult. Most dacoits of Chambal had turned bagis after they had killed someone in a property dispute or family feud. These bagis were outlawed but respected by their communities because they stood up for their family prestige. This is another reason why the dacoits of yore are deified in their villages today. While glorifying Man Singh and his ilk, the residents here hold the contemporary dacoits in utter contempt. They say the present-day dacoits in Chambal are mere mercenaries whose only aim is to make money. "Man Singh was not after money but honour. He only demanded money from the rich and shared it with the poor", says another villager. Man Singh’s descendants take great pride in counting the members of their family who became bagis and the number of people they killed in the name of family honour. The more the number of people, the more superior they feel. Man Singh’s grandson, Jandail Singh, 78, not only worships his grandfather in the temple but he started his life stepping into his shoes. From 1953 to 1963, Jandail Singh was behind bars for hobnobbing with the outlaws. Twirling his thick white moustache (that he grows like Man Singh), he says that many of his cousins and all his four uncles were bagis. Naresh Singh, Man Singh’s 61-year-old great-grandson, says he never saw his father because he was a bagi and he presumes the police have killed him. Despite being on the run, Man Singh had the mandate of the people. He virtually decided important panchayat matters from the deep recesses of the Chambal ravines and forests. Along with his lieutenant, Roopa Singh, he governs their hearts and souls today. MAN SINGH had become a legendary figure in his own lifetime. He had shown somewhat opposing personal traits. He was ruthless and God-fearing and he was tyrannical yet magnanimous. In contemporary times, Chambal valley has come to be identified with the name of Man Singh. His career had provided a kind of romantic aura to the otherwise inglorious vocation of dacoity. Till the time of his elimination, he had built up an impressive record—his gang, it was estimated, had committed some 1,112 dacoities, 185 murders and collected about Rs. 500,000 as ransom; it had braved some 90 encounters with the police, killing 32 policemen, including those put to death defenselessly outside encounters, and losing 15 of its own members. 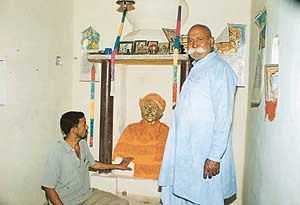 Man Singh was born at the close of the 19th century in a Kshatriya family in a village in southern Agra. His family developed some row with a Brahmin family in the village, which gradually assumed serious proportions. As a consequence, in 1928, Man Singh with some other members of his family killed two persons related to the rival Brahmin family. Following this ghastly event, he, his brother, his nephew and his eldest son absconded and took to the ravines. He himself after some time was arrested and sentenced for life. He was, however, released from jail in 1939. But continuing the bloody family feud had become his life mission. He was shrewd and farsighted. He had built a formidable gang. The gang membership usually ranged between a manageable 8 to 10, restricted to his own kith and kin with some conspicuous exceptions. He encouraged and helped the formation of several small bandit-gangs—a measure that cumulatively unleashed terror upon the inhabitants and thwarted the police efforts. His gang members used to receive training in handling weapons and sported khaki uniform. He also took advantage of the bustle of the war and acquired automatic rifles .303 rifles hand-grenades binoculars and the like. His depredations became so alarming that in 1945, apart from the police, the Army troops were also deployed, but without much avail. In the valley, the idea gained currency that the gang was invincible. Man Singh, as a matter of fact, encouraged it. He started adjudicating small disputes in villages, and occasionally helped the needy. When the country attained Independence and a general pardon was announced, for a brief spell, he returned to his village with a great show of pomp. The inhabitants bestowed upon him the honorific address of ‘Raja Man Singh.’ But the impulse of the old blood feud soon made him restless. He did some more killings, and fled to the ravines afresh. His right-hand man, Roopa, and other members escaped but Man Singh and his son Subedar Singh were killed on the spot. Roopa became the leader of the gang after Man Singh was shot dead. He did a good deal to perpetuate the Man Singh legend. In fact, in certain respects, he was found to be a step ahead of his infamous predecessor. Roop Narain Sharma alias Roopa was born in a small village in Agra. His father was reported to have cultivated friendship with Man Singh in jail in 1928. As a child, he was stated to be of violent temperament. During his childhood, he had an occasion to experience rude police behaviour. For a brief period, he did receive schooling. However, he joined the gang of Man Singh at an early age and, in no time, he became one of his principal lieutenants. After the initial confusion, following the fall of Man Singh, was over, Roopa reassembled the gang. He reorganised and enlarged the gang with a difference— it was more ferocious and more merciless. During the independent career of about five years, Roopa and his gang were credited with some 200 murders. He was killed in an encounter in 1959. (Sources: Official records of the M.P.Govt. ; U.P. AOPR).